I love corn. 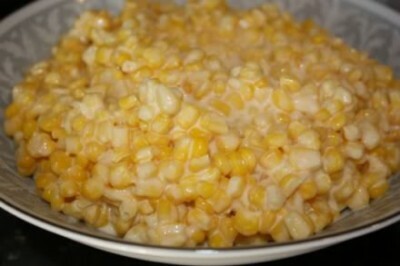 It is one of my favorite side dishes, but I like corn dishes that are a little different. The first time I had this corn dish I loved it. It was a bit unusual, but very good. A friend of mine had brought it to a church dinner and I knew I had to have the recipe. When she told me how easy the recipe was to make I was surprised. I really thought it must be complicated because it was so good. But she said it was an old Taste of Home recipe and it was simple. I made this and took it to Thanksgiving at my in-laws. I like this recipe for holidays and church dinners because it is a crockpot recipe. You can make it up ahead of time and start the cooking several hours before dinner it to be served. This means less to do right before the meal. In a 3-qt. slow cooker, combine all the ingredients. Cover and cook on low for 3 to 4 hours or until heated through and the cheese is melted. Stir well before serving. For more recipes and ideas see Frugal Fridays, Foodie Fridays, and Grocery Cart Challenge. Yea! I have corn and processed cheese in my freezer- and since I am using every single thing in it as a challenge, this recipe is just perfect. Thank you for helping me clean out my freezer and do it in good taste! I have been looking for corn recipes, am going to try this one. Would it be a good idea to bake this? @Shirley, I think baking this would be fine. I wouldn’t have thought to put cream cheese in corn–it sounds divine. I love that it can be made in a Crockpot! I had some fresh corn with cream cheese at a cafe in TX this summer. It was so very good! Your recipe looks like it will be one to go in our family favorites! Thanks! Yum! I actually made something like this on Thanksgiving. I’m going to have to give your recipe a try. Thank you so much for the post! Isn’t everything better with cream cheese? 🙂 This looks devine! Oh, this sounds sooo yummy! I adore corn as well! This looks heavenly =D. I love corn w/cream cheese in it. I haven’t put it in the crock pot. I add green chiles to it too. Very tasty!